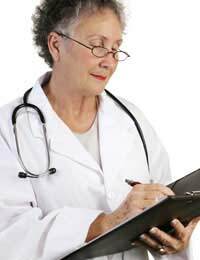 Menopause is diagnosed by your physician when twelve months have passed since your last menstrual period. However, you may also want to know how you can tell if you have begun to enter the menopausal transition. As women, many of us like to know what is happening in our bodies and we want to be sure that symptoms we experience are natural, normal and healthy parts of menopause rather than another health condition. Fortunately, there are a number of ways that a doctor can indicate you are entering the menopausal transition. In this way, you can make appropriate changes to help your transition and you can access important treatments to ease menopause symptoms. Clinically speaking, your doctor would diagnose menopause when you have been without a menstrual period for twelve months and have not experienced any other medical condition that would cause your periods to stop. For instance, eating disorders such as anorexia nervosa can cause menstruation to stop, but once nutrition is regained and weight is similarly gained, periods will usually start again. As such, this type of situation would not warrant a diagnosis of menopause. Hormone levels can be used to suggest that menopause is near or that it has occurred but they are not considered reliable enough to make a firm diagnosis. This is because hormonal levels vary from one woman to another and they also fluctuate throughout the month. No hormonal test can give a definite and reliable indication of when women are going to experience menopause. However, a doctor can still check oestrogen levels over a course of several months to observe for changes, although it is only one factor to observe. In an ideal world, either you or your doctor could predict exactly when menopause would occur. In this way, you could do your family planning and preparation for physical and emotional changes that come with menopause. Unfortunately, there is no way to predict exactly when women can be diagnosed with menopause. However, there are still some ways to assess the general time period when a woman will enter menopause. If she is at least fifty years old and has not had a period for three to eleven months as well as irregular periods over the preceding twelve months, a doctor can obtain a reasonable estimate of a woman's menopause. Since the perimenopausal stage represents a woman's entrance into the menopausal change, symptoms in perimenopause such as hot flushes, night sweats, irregular periods and mood swings can be a strong indicator that menopause is on its way. While it won't prompt a diagnosis of menopause, these symptoms can alert you and your physician to the beginnings of this change of life. A doctor can check the level of your Follicle Stimulating Hormone (FSH), which can suggest that you are entering the menopausal transition. Obtaining an accurate diagnosis of menopause is important for a number of reasons, including your decision to stop using birth control now that you are considered infertile. However, you should ideally be making healthy lifestyle choices prior to menopause. Strengthening your bones with a calcium rich diet to protect against osteoporosis along with maintaining an active lifestyle and quitting smoking can all help to buffer against the oestrogen loss that is experienced with menopause. Whether you have already been diagnosed with menopause or you are just beginning perimenopause, you should take a proactive approach to your health today.